The head of the UK's main business lobby group has said too many people are "stuck" in minimum wage jobs, despite an upturn in the UK economy. 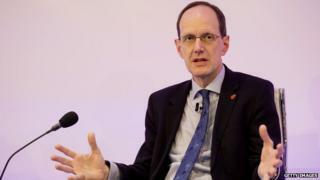 John Cridland, director general of the CBI, said businesses should deliver "better pay and more opportunities" for their employees. He told the BBC: "If we get productivity going, we are creating more wealth, and we can share it." Recovery should be sustainable before wages increased, he said. Mr Cridland said: "It's nice for once to have a somewhat more upbeat message. The message is, if the economy is growing, we can have everybody swim upwards." Media captionCridland: "if we get productivity going, we create more wealth, which we can then share. But he said lacking productivity was a "bit of a worry" in the UK economy and that it was important that skill shortages did not undermine recovery. In his annual new year's message, Mr Cridland said despite economic growth, there were "still far too many people stuck in minimum wage jobs without routes to progression, and that's a serious challenge that businesses and the government must address." Mr Cridland said businesses must support employees in "every part of the country" to progress in their careers and help young people get their first jobs. He called for a vocational system, similar to Ucas, to help raise awareness about other routes to higher skills. Mr Cridland said: "If 2013 was the year that business trust took a hammering on a range of issues from corporate taxation to energy prices, then 2014 must be the year that business leaders take action to rebuild that trust." His comments came as the Chartered Institute of Personnel and Development (CIPD) warned 2014 had to be a "year of productivity" if earnings were to rise sustainably. Mark Beatson, chief economist at the CIPD, said: "Employment growth looks set to continue at an impressive rate over the year to come. However, the downside is that UK productivity has yet to improve and remains below its pre-recession level." He said the low productivity was behind falling real wages and the high cost of living in the UK. Mr Beatson said: "Central to this [lacking productivity] is business and government acting together to improve the way people are managed, with more emphasis on working smarter and creating value. " He said the "crisis of trust" in many organisations had to be tackled to boost productivity, alongside making more use of the "skills and talents of our workforce".